The Wainwrights are a list of hills appearing in the seven volumes of Alfred Wainwright's Pictorial Guides to the Lakeland Fells. The list is subjective - some of the hills are not summits at all - just prominent points at the end of a ridge or spur from a higher mountain. Wainwright produced an additional volume entitled The Outlying Fells of Lakeland - a page for these is included, click on the link below. 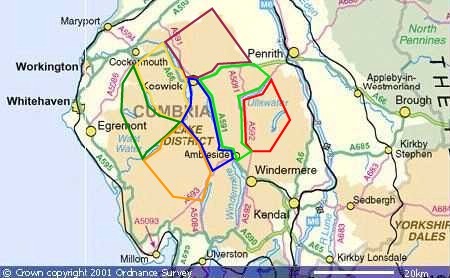 (Wainwrights appear as Class=W on this website, and the Outlying Fells as Class=WO).